We found out just about everything about the Nexus 5 over the past several weeks thanks to leak after endless leak. Today Google finally revealed its horribly kept secret, and there are very few surprises. Here's what you need to know. 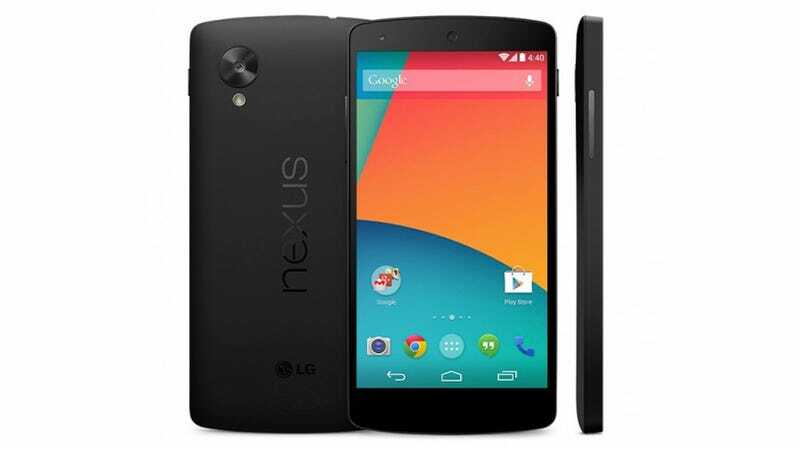 The Nexus 5 has grown a little bit since its Nexus 4 predecessor. It has a 5-inch, 441 PPI, full HD display. It's thinner, lighter, of course has a bigger screen, a horizontal Nexus logo, and a much bigger camera lens. The LG phone has 2GB of RAM and is packed with a 2.3GHz Snapdragon 800 chip, which is like muscle car specs in a smartphone. It's a quad-core chip that has a bonus core that lets you do stuff while the rest of the phone is asleep, which gives you a little help with battery life. Speaking of which, you're looking at a healthy 2300 mAh battery that should hopefully get you through the day on one charge. The back camera has an 8MP shooter and there's a 1.3MP lens on the front, which is disappointingly, very similar to the Nexus 4's hot mess. However, the camera has some new features that might make it perform better. Finally, the device has LTE support for AT&T, T-Mobile, and Sprint, HSPA+ bands plus GSM and CDMA, dual-band Wi-Fi, Bluetooth 4.0, NFC tech, and Qi wireless charging. One of the most appealing parts of the Nexus 5—and any Nexus phone, really—is that it'll come loaded with the latest and greatest version of Android. In this case, that means Android 4.4 (codename: KitKat, because marketing). You can get the full KitKat rundown here, but the main takeaway is that most of the improvements are under the hood, aside from being able to jump directly into Google Now by saying "Okay Google" into your Nexus 5. Neat! Other handsets are expected to get the update soon, but you don't care about other handsets. You care about the Nexus 5, because it's the only phone that has it right now. Once again, this is an area where the Nexus 5 matches up pretty well with the 4. It's $350 for the 16GB off contract and $400 for the new 32GB version. You can pick it up from the Google Play store starting now.